Not to be confused with Stratford, Connecticut; Stafford, Connecticut; or Stanford, California. Stamford (/ˈstæmfərd/) is a city in Fairfield County, Connecticut, United States. According to the 2010 census, the population of the city is 122,643. As of 2017, according to the Census Bureau, the population of Stamford had risen to 131,000, making it the third-largest city in the state (behind Bridgeport and New Haven) and the seventh-largest city in New England. Approximately 30 miles (50 kilometers) from Manhattan, Stamford is in the Bridgeport-Stamford-Norwalk Metro area which is a part of the Greater New York metropolitan area. Stamford is home to four Fortune 500 Companies, nine Fortune 1000 Companies, and 13 Courant 100 Companies, as well as numerous divisions of large corporations. This gives Stamford the largest financial district in the New York metropolitan region outside New York City itself and one of the largest concentrations of corporations in the United States. Stamford was known as Rippowam by the Native American inhabitants to the region, and the very first European settlers to the area also referred to it as such. The present name is after the town of Stamford, Lincolnshire, England. The deed to Stamford was signed on July 1, 1640 between Captain Turner of the New Haven Colony and Chief Ponus. By the 18th century, one of the primary industries of the town was merchandising by water, which was possible due to Stamford's proximity to New York. Aerial view of the Downtown and South End neighborhoods of Stamford with Long Island in the distance. New Canaan officially separated from Stamford when it incorporated as a town in 1801, followed by Darien in 1820. Starting in the late 19th century, New York residents built summer homes on the shoreline, and even back then there were some who moved to Stamford permanently and started commuting to Manhattan by train, although the practice became more popular later. Stamford incorporated as a city in 1893. In 1950, the Census Bureau reported the city's population as 94.6% white and 5.2% black. In the 1960s and 1970s, Stamford's commercial real estate boomed as corporations relocated from New York City to peripheral areas. A massive urban redevelopment campaign during that time resulted in a downtown with many tall office buildings. The F.D. Rich Co. was the city-designated urban renewal developer of the downtown in an ongoing redevelopment project that was contentious, beginning in the 1960s and continuing through the 1970s. The company put up what was the city's tallest structure, One Landmark Square, at 21 floors high, and the GTE building (now One Stamford Forum), along with the Marriott Hotel, the Stamford Town Center and many of the other downtown office buildings. One Landmark Square has since been dwarfed by the new 34-story Trump Parc Stamford condominium tower, and then again by the Atlantic Station development, another project by the Rich Company in partnership with Cappelli Enterprises. Over the years, other developers have joined in building up the downtown, a process that continued, with breaks during downturns in the economy, through the 1980s, 1990s and into the new century. Since 2008, an 80-acre mixed-use redevelopment project for the Stamford's Harbor Point neighborhood has added additional growth south of the city's Downtown area. Once complete, the redevelopment will include 6,000,000 square feet (560,000 m2) of new residential, retail, office and hotel space, and a marina. As of July 2012, roughly 900 of the projected 4,000 Harbor Point residential units had been constructed. New restaurants and recreational activities have come up in the Harbor Point area, which is considered as New Stamford. Stamford is situated near the southwestern point of Connecticut, on the Long Island Sound. It comprises a number of neighborhoods and villages including Cove, East Side, Downtown, North Stamford, Glenbrook, West Side, Turn Of River, Waterside, Springdale, Belltown, Ridgeway, Newfield, South End, Westover, Shippan, Roxbury and Palmers Hill. North of the Merritt Parkway is considered the North Stamford section of the city. North Stamford encompasses the largest land mass in Stamford, however it is the least densely populated area of the city. North Stamford functionally and legally acts as one municipality with the City of Stamford. Towns surrounding Stamford include Pound Ridge, New York to the north, Greenwich to the west, and both Darien and New Canaan to the east. 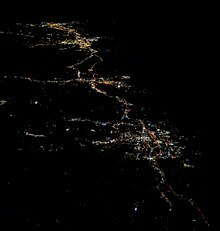 The city has an area of 52.09 square miles (134.9 km2), making it the largest city by area in the state. Under the Köppen climate classification, Stamford has a temperate climate (Cfa), with long, hot summers, and cool to cold winters. Stamford, like the rest of coastal Connecticut, lies in the broad transition zone between the continental climates of New England and southeast Canada to the north, and the milder temperate and subtropical climates to the south. The warm/hot season in Stamford is from mid-April through early November. Late day thundershowers are common in the hottest months (June, July, August, September), despite the mostly sunny skies. The cool/cold season is from late November though mid March. Winter weather is far more variable than summer weather along the Connecticut coast, ranging from sunny days with higher temperatures to cold and blustery conditions with occasional snow. Like much of the Connecticut coast and nearby Long Island, NY, some of the winter precipitation is rain or a mix and rain and wet snow in Stamford. Stamford averages about 30 inches (75 cm) of snow annually, compared to inland areas like Hartford and Albany which average 45–60 inches (110–150 cm) of snow annually. Although infrequent, tropical cyclones (hurricanes/tropical storms) have struck Connecticut and the Stamford metropolitan area. Hurricane landfalls have occurred along the Connecticut coast in 1903, 1938, 1944, 1954 (Carol), 1960 (Donna), 1985 (Gloria). Tropical Storm Irene (2011) also caused moderate damage along the Connecticut coast, as did Hurricane Sandy (which made landfall in New Jersey) in 2012. Coastal Connecticut is the broad transition zone where so-called "subtropical indicator" plants and other broadleaf evergreens can successfully be cultivated. Stamford averages about 90 days annually with freeze - about the same as Baltimore, Maryland. As such, Southern Magnolias, Needle Palms, Windmill palm, Loblolly Pines, and Crape Myrtles are grown in private and public gardens. Like much of coastal Connecticut, Long Island, and coastal New Jersey, the growing season is rather long in Stamford - averaging 210 days from April 8 to November 5 according to the National Weather Service in Bridgeport. Stamford is composed of approximately 45 distinct neighborhoods, including 2 historic districts. Five islands are situated in Long Island Sound: Cove Island, Grass Island, Greenway Island, Jack Island, and Cuties Island, also known as Vincent Island. The population density is 3,101.9 people per square mile (1,197.5/km2). Stamford has one of the most highly educated populations in the U.S. Nine out of ten are high school graduates. Those possessing a bachelor's degree or higher is estimated at 43.6% of the population. Stamford is tied with Iowa City, Iowa for the U.S. metropolitan area with the highest percentage of the adult population holding a bachelor's degree or higher; 44 percent of adults hold a degree. There are 47,317 housing units at an average density of 1,253.6 per square mile (484.0/km2). There are 45,399 households out of which 28.7% had children under the age of 18 living with them, 48.5% were married couples living together, 11.5% had a female householder with no husband present, and 36.2% were non-families. 28.7% of all households were made up of individuals and 9.8% had someone living alone who was 65 years of age or older. The average household size was 2.54 and the average family size was 3.13. According to a 2007 estimate, the median income for a household in the city was $72,315, and the median income for a family was $88,205. Males had a median income of $48,386 versus $36,958 for females. The per capita income for the city was $34,987. About 5.4% of families and 7.9% of the population were below the poverty line, including 8.7% of those under age 18 and 9.7% of those age 65 or over. Stamford is predominantly Democratic, yet the least Democratic of Connecticut's urban cities. The current mayor is David Martin, a Democrat. Notable Republicans include former US representative Chris Shays, former Lieutenant Governor Michael Fedele, and former mayor Michael Pavia. Democrats include Attorney General William Tong, Former Governor Dannel Malloy, US Senator/former CT Attorney General Richard Blumenthal, CT Attorney General George Jepsen, former US Attorney General/mayor Homer Stille Cummings, CT Supreme Court Justice Andrew J. McDonald, and Chief Justice of the CT Supreme Court Richard A. Robinson. Other notable politicians with Stamford roots include Independent (former Democrat) US Senator/2000 Vice-Presidential nominee/CT Attorney General Joseph Lieberman, conservative commentator William F. Buckley, Jr., and French Prime Minister Georges Clemenceau. Voter registration and party enrollment as of November 2017. Stamford is located on the New Haven Line on the Metro-North Railroad, the commuter rail system for northern metropolitan New York City. Stamford is the busiest station on the Metro-North system, after only Grand Central Terminal, and serves as a major transfer point for local trains. Stamford Station is also the terminus of a Metro-North branch that ends in New Canaan, 8 mi (13 km) away, and a part-time terminal of Shore Line East trains. Two smaller train stations in Stamford are Glenbrook and Springdale, both a part of the New Canaan branch. Commuter trains come into Stamford from all points between New London to the east and New York (Grand Central Terminal) to the south. The average non-stop commute is forty-seven minutes. Trains operate from the Stamford station between 4:43 AM (first departure to Grand Central) until 12:55 AM (last departure to Grand Central). Stamford also serves as a station along the Amtrak route. Acela, the high speed train service between Boston and Washington, makes several daily stops in Stamford. Amtrak's Northeast Regional (Springfield, Massachusetts to Washington, D.C.) and Vermonter (Saint Albans, Vermont to Washington, D.C.) also make daily stops in Stamford. Amtrak tickets can be purchased on the upper level of the Stamford station. Stamford is within reasonable driving distance of six airports: two regional, four international. Regional: Westchester County Airport (often referred to as White Plains Airport) which borders the town of Greenwich, and Tweed New Haven Airport, in East Haven, CT.
International: LaGuardia Airport and John F. Kennedy International Airport both in Queens, N.Y., Newark Liberty International Airport in Newark/Elizabeth, New Jersey and Bradley International Airport in Windsor Locks, Connecticut. City bus transportation is provided by CT Transit, which is run and financed by the Connecticut Department of Transportation. The main terminal is adjacent to the train station on State Street, under the I-95 highway. Bus service runs along major arterial roads through the towns of Darien, Norwalk, Greenwich and Port Chester, New York. A non-stop direct route is also offered to White Plains, New York. Commuters can connect in Norwalk to points as far east as Milford and as far north as Danbury. Additional connections can be made in Port Chester and White Plains to all points covered by the Bee-Line bus system in Westchester County. Greyhound provides inter-city bus service from the lower level of the Stamford train station. Bus service is provided to New Haven (Union Station), Boston (South Station), and New York (Port Authority). Two limited-access highways run through the city. Interstate 95 serves as the main route through downtown Stamford with four exits (6-9). The Merritt Parkway runs through the northern part of the city. This road is designated for passenger vehicles only. Any congestion on the Merritt Parkway is mostly likely to occur on the southbound lane in the morning and the northbound in the evening (route to and from New York). At night, due to the absence of lighting, visibility on the Merritt Parkway is relatively poor. Stamford exits on the Merritt Parkway are 33-35, and exit 36 is just over the border in New Canaan. Stamford is also served by four other state highways. Route 1, also known as Main Street in Stamford, is also used as a major artery during the morning and evening commute. Most traffic via Route 1 is short distance or fairly local, yet vehicles have utilized Route 1 during times of heavy congestion on I-95 as a re-route. Route 137 (Washington Boulevard and High Ridge Road) is the main north-south road of the city and runs from the Stamford Transportation Center and serves the Turn of River, North Stamford, and High Ridge sections of the city. Route 104 (Long Ridge Road) branches off from Route 137 to serve the Long Ridge section. Route 106 (Courtland Avenue) serves the Glenbrook neighborhood and continues towards the town of Darien. Stamford's cluster of corporate headquarters includes a number of Fortune 500, Fortune 1000, and Forbes Global 2000 companies. In 2017, Stamford had four Fortune 500, nine Fortune 1000, three Forbes Global 2000, and one Fortune Global 500 company. Among the larger companies with headquarters in Stamford are Charter Communications, Synchrony Financial, Indeed.com, United Rentals, Conair, Gartner, Henkel North American Consumer Goods, WWE, Pitney Bowes, Gen Re, NBC Sports Group, Nestle Waters North America, Crane Co. and Vineyard Vines. UBS's Stamford trading floor holds the Guinness World Record as the largest column-less trading floor in the world. The Royal Bank of Scotland moved its North American operations into Stamford in 2009, including its RBS Greenwich Capital subsidiary. The Harbor Point development, located in the South End, is one of the largest private-sector development projects in the United States. Many large retail stores, such as Design within Reach (which is also headquartered in Stamford) and Fairway Market have moved in, along with multiple companies including ITV America, McKinsey & Company, Bridgewater Associates, and the headquarters of Starwood Hotels (Now Marriott International), and KAYAK.com. According to FBI statistics in 2014, Stamford is the 16th safest of the 269 cities in the nation and well ahead of any in Connecticut with a population greater than 100,000 that report crime statistics to the FBI. In 2015, Stamford had 3 murders, 19 rapes, and 92 robberies. Crime in Stamford is much more controlled in comparison to cities with similar population size in Connecticut and nationally. Lower crime rates in Stamford are attributed to the city's robust economic growth in recent decades. Criminal cases are prosecuted by The State's Attorney's Office and Stamford is home to a State Superior Court which is located on Hoyt Street adjacent to the Stamford Police Department. A not-for-profit agency, Stamford Emergency Medical Services (SEMS) provides pre-hospital emergency care in Stamford, Connecticut. SEMS also provides contracted paramedic intercept response to Darien Emergency Medical Services, located in Darien, Connecticut. SEMS is the only Connecticut EMS service accredited by the Commission on the Accreditation of Ambulance Services (CAAS). All SEMS units are staffed by at least one Connecticut-licensed paramedic. Stamford EMS responds to 14,000 calls annually. Fire protection in the city of Stamford is provided by the paid The Stamford Fire Rescue Department(SFRD) and 4 all-volunteer Fire Departments: Glenbrook-New Hope, Belltown, Springdale, Turn of River, and 1 Combination Company, Long Ridge. Budgeting and districting of the various fire departments throughout the city has been unstable since 2007, due to an extended legal conflict between the volunteer departments and the Malloy administration. As of May 16, 2012, a decision was reached by the city's charter revision committee to combine the paid and volunteer fire departments into one combination fire department, known as the Stamford Fire Department. The Stamford Police Department (SPD) is Stamford's only police force and has lost four officers in the line of service since 1938. The police force has about 280 sworn police officers making it the 5th largest police force in Connecticut after Hartford, New Haven, Bridgeport, and Waterbury. Most Stamford Officers were trained at the Connecticut Police Training Academy before patrolling in the city. Aside from Police Headquarters, located at 805 Bedford St. in Downtown Stamford, SPD also operates substations in Stamford's West Side at Wilson St. and W. Main St. and at 1137 High Ridge Rd and Hope Street. A new police headquarters is currently being constructed adjacent to the current one, and it is expected to open at the end of 2018. The current Chief of Police is Jonathan Fontneau who was appointed by former Mayor Michael Pavia in 2012. Stamford has branches of the University of Connecticut, University of Bridgeport and Sacred Heart University. The University of Connecticut's campus is located in a large modern building in downtown that opened in 1998 after extensive renovations to an abandoned former Bloomingdale's store that closed in 1990. The University of Bridgeport is located in the River Bend Executive Center, Fairfield County's premier communication and information high tech park, While Sacred Heart University is located at Landmark Square. In 2017, UCONN Stamford opened a 300 student dormitory hall around the corner from the Stamford Campus on Washington Blvd. As no study has been conducted to assess the cost of education in Stamford, it is difficult to tell whether or not Stamford has a well-funded public education system. Although providing a public education is a state responsibility, Connecticut ranks near the bottom in state share of public education expenditures. Thus, the majority of education funding must come from local governments like that of Stamford. According to the State Department of Education, in the 2004-05 academic year, 42.7% of Stamford's public school students were economically disadvantaged, 34.8% did not have English as a home language and 11.6% were students with disabilities. Research has shown that these populations need additional resources to meet state academic standards. Owing to the state school finance system, the burden of these extra necessary costs of education falls primarily on Stamford's local government. The public school system is an integrated district with racial balance requirements exceeding those of the state of Connecticut. State standards require that a school's racial makeup be within 25% of the community's racial makeup. Stamford's standard is a more strict 10%. Over the years, schools have become unbalanced. Stamford has three public high schools: Westhill High School, Stamford High School, and the Academy of Information Technology and Engineering. The city also has several private schools, including Trinity Catholic High School, Villa Maria School, and Bi-Cultural Jewish Day School, King Low Heywood Thomas, and The Long Ridge School as well as two state charter schools: Trailblazers Academy Charter Middle School and Stamford Academy Charter High School, both operated by human services nonprofit Domus. Stamford's public library, the Ferguson Library, is one of the largest in Connecticut. The library also shows movies and has a used book store run by Friends of Ferguson Library. There is a Starbucks located right next to the Ferguson Library. The library has branches in South End, Springdale, and the Turn of River sections of the city, it also has a bookmobile that runs daily to different neighborhoods. The Turn of River branch, officially called the Harry Bennett Branch, is the largest library branch in the state. That branch also has a used book store run by Friends of Ferguson Library. The first Marathon race to be held in the United States, on September 19, 1896, had its start line at Stamford Armory. The race, which finished in Williamsbridge, Bronx, was won by John J. McDermott of New York City in a time of 3:25:55.6. The New England Force, a professional soccer team based in Stamford, made its debut in the American Soccer League in August 2014. NBC Sunday Night Football and the pre-game Football Night in America show has aired from Stamford since 2014. The Connecticut Whale (NWHL), one of four charter franchises in the National Women's Hockey League, has competed at the Terry Conners Ice Rink since 2015. Mill River Park - This park is located in the center of downtown but its ancient grist mill (present when George Washington traveled through Stamford) was modernized in the 1920s. There are numerous community activities offered at the park coordinated by the Mill River Park Collaborative. Cummings Park, a public beach, was once a popular spot for shell-fishing. The park was developed in 1906 and had been known as Halloween Park because Mayor Homer Cummings cast the deciding vote to create it on Halloween Night. Stamford boasts miles of accessible shoreline for recreation as well as two public beaches. The 83-acre (340,000 m2) Cove Island Park, once a farm and then an enormous factory site (Stamford Manufacturing Company), offers visitors a choice of beaches as well as picnic grounds and bluffs. It has a small wildlife sanctuary in the southwest corner that might be interesting for bird watchers. SoundWaters Community Center for Environmental Education is located at the northeast part of the park. Jackie Robinson Park on the West Side is named after baseball legend Jackie Robinson, who lived in Stamford. Terry Connors Ice Rink shares a parking lot with Cove Island Park. It offers public ice skating, group lessons, and ice hockey. It is the home of the Stamford Youth Hockey Association. Scalzi Park on Bridge Street has a playground, baseball and softball fields, volleyball courts, tennis courts, bocce courts, basketball courts, roller hockey courts, and a baseball stadium named "Cubeta Stadium." A concrete skate park was opened at Scalzi in July 2007 for $309,850 which was designed and built by Grindline Skateparks Inc. of Seattle, Washington. Stamford has two municipal golf courses. Sterling Farms Golf Course opened in May 1972 and is the more popular of the two courses. The facility also has a driving range, restaurant, and six tennis courts. The E. Gaynor Brennan Golf Course, referred to locally as Hubbard Heights, opened for play in 1922 as a private course and was purchased by the city in 1949. Dorothy Heroy Park Is located in North Stamford. The Italian Center features tennis courts, swimming pools, fitness centers, a playground and a miniature golf course. The YMCA of Stamford offers swimming lessons and sports which include; basketball and indoor soccer. Programs are also available periodically for physical fitness. The Stamford Yacht Club is a private organization that provides members with access to boating activities and additional amenities. The Stamford Museum and Nature Center on a 118-acre (0.48 km2) site in the northern end of town, has a collection of works by Gutzon Borglum, the sculptor of Mount Rushmore, who was a Stamford resident for a decade. The Fairfield County Astronomical Society was started up in 1954 runs the Stamford Observatory, which has a 22-inch (560 mm) telescope. Bartlett Arboretum and Gardens is a 91-acre (370,000 m2) botanical gardens and science education center boasting over 850 specimen trees and plants from around the world. It is also home to several Champion Trees; the largest of their species within Connecticut. SoundWaters Community Center for Environmental Education is located in Cove Island Park. Curtain Call Inc. presents plays and other entertainment at the Sterling Farms Theatre Complex, 1349 Newfield Ave.
Stamford Center for the Arts: The Palace Theatre, originally opened as a vaudeville house in 1927, reopened as a nonprofit theater in 1983. It was joined in 1992 by the Rich Forum, another downtown venue. Both have been run by the Stamford Center for the Arts. The Rich Forum is occupied by NBCUniversal as a television studio where various television shows are taped and produced including The Jerry Springer Show, Maury, and The Steve Wilkos Show, The Trisha Goddard Show, and Crazy Talk. Bow Tie Cinemas has two first-run movie houses in Stamford with a total of 15 movie screens: Landmark 9 and Majestic 6.The Avon Theatre Film Center, a two-screen nonprofit movie house focusing on first-run independent movies, is located on Bedford Street. The Ferguson Library also shows movies. Stamford Symphony Orchestra In a typical season, the SSO gives five pairs of classical concerts and three pops concerts at the 1,586-seat Palace Theatre, as well as a concert for elementary school students and a family concert series. Connecticut Grand Opera, a not-for-profit, professional opera company performs at the Palace Theatre. On its web site, the CGO claims to offer "the most ambitious opera season of any company between New York and Boston." Alive @ Five is an annual summer concert located in Columbus park typically lasting 6 weeks. Treetops CMS, a non-profit chamber music organization, is located in Westover, providing six chamber music concerts annually, as well as art exhibits and installations. A view of the gothic revival exterior of St. Mary's Church on Elm Street in Stamford. UCONN Stamford Art Gallery- showcases both emerging and established artists. Franklin Street Works- maintains an art space in the downtown area. Stamford Loft Artists Association- provides support for visual artists and opportunities to exhibit their work. NBC Sports Group world headquarters is located in Stamford, connected to Chelsea Piers Connecticut. All studios are based in Stamford, including Football Night in America, and all the NBC Olympic coverage. Three NBCUniversal syndicated programs relocated to Stamford's Rich Forum: Maury came to Stamford from New York City, while The Jerry Springer Show and The Steve Wilkos Show were previously based in Chicago. Television show The People's Court has taped in Stamford since 2012. WWE has had its global headquarters in Stamford since 1985, back when it was Titan Sports. Fortune 100 company, Charter Communications' world headquarters has been based in Stamford since 2012. Charter distributes services through their Spectrum brand. Stamford serves as a major office for YES Network, the The Yankee Entertainment and Sports Network. A+E Networks has a major production studio based in Stamford. Soap operas All My Children and One Life to Live were taped in Stamford in 2013. This Old House relocated its headquarters to Stamford from Manhattan in 2016, and has about 50 employees in the city. Stephen David Entertainment, a division of Banijay Group, opened a production office in Stamford in 2019.
Who Wants to Be a Millionaire started taping in 2014 at the Connecticut Film Center. Synapse Group, part of Time Inc. now owned by Meredith Corporation, is headquartered in Stamford. Chief Executive Group is headquartered in Stamford, and publishes Chief Executive Magazine. Stamford, Connecticut served as a location for one of five branches of the fictional Dunder Mifflin paper company from the US television series, The Office. The branch was show during several episodes during the 3rd season of the show, and exterior shots were of the Starwood Hotels headquarter building located at 333 Ludlow in Stamford's South End. The TBS sitcom Are We There Yet, starring Terry Crews, was shot at the Connecticut Film Center located in Stamford. Stamford Advocate, daily newspaper, owned by Hearst Communications. The Stamford Times, weekly newspaper, owned by The Hour Newspapers. Stamford Plus magazine is published by Canaiden LLC. El Sol News, weekly Spanish-language newspaper. La Voz, weekly Spanish-language newspaper. ^ "Connecticut population in 2010" (CSV). 2011 Population Estimates. U.S. Census Bureau, Population Division. March 2011. Retrieved July 9, 2007. ^ "U.S. Census Bureau QuickFacts: Stamford city, Connecticut". Census.gov. Retrieved January 21, 2019. ^ "Four Stamford Companies Make The Fortune 500 List". The Stamford Daily Voice. May 6, 2013. ^ Godbeer, Richard (January 2005). "Chapter 1: Katherine Branch's Fits". Escaping Salem. Oxford. ISBN 0-19-516130-0. ^ Charles, Eleanor (September 26, 1999). "Commercial Property /Stamford, Conn.; A Pioneer Business Park That Confounded Critics". Nytimes.com. ^ "Trending: Why one city is booming". Connecticut Post. ^ "Stamford Master Plan" (PDF). stamfordct.gov. Retrieved February 4, 2019. ^ "Climatography of the United States No. 20: STAMFORD 5 N, CT 1971–2000" (PDF). National Oceanic & Atmospheric Administration. Retrieved December 7, 2011. ^ "Monthly Averages for Stamford, CT (06902)". The Weather Channel. Retrieved December 7, 2011. ^ "Stamford, CT neighborhood Map - Best and Worst Neighborhoods". Areavibes.com. Retrieved February 11, 2017. ^ US Census Bureau. "Census.gov". Census.gov. ^ "Connecticut Secretary of the State : Registration and Party Enrollment Statistics as of November 1, 2017 : Based on reports as provided to the Secretary of the State by the Registrars of Voters" (PDF). Portal.ct.gov. Retrieved January 21, 2019. ^ "Registration and Party Enrollment Statistics as of October 30, 2014" (PDF). Connecticut Secretary of State. Archived from the original (PDF) on September 23, 2006. Retrieved April 26, 2015. ^ Lytton, Barry (December 7, 2018). "Stamford train station gets $22.9M for improvements". StamfordAdvocate. Retrieved February 4, 2019. ^ "The World's Biggest Public Companies". Forbes.com. Retrieved August 23, 2017. ^ "Fortune 500 Companies 2017: Who Made the List". Fortune.com. Retrieved August 23, 2017. 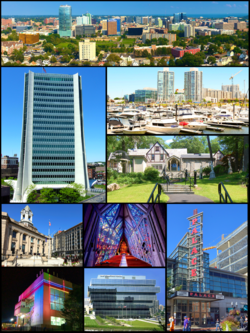 ^ "Stamford's Major Employers | Stamford CT". Stamfordct.gov. Retrieved August 23, 2017. ^ "Harbor Point Spurs Stamford's Economic Growth with Thousands of New Jobs". Prweb.com. March 11, 2012. ^ "Stamford police say downtown is safe, despite homicide and other recent crimes". Stamfordadvocate.com. ^ "Crime in Stamford, Connecticut (CT): murders, rapes, robberies, assaults, burglaries, thefts, auto thefts, arson, law enforcement employees, police officers, crime map". City-data.com. ^ "STAMFORD EMS – A Not-For-Profit Charitable Organization Providing Consistent, Compassionate, Quality Paramedic Ambulance Services". Stamfordems.org. ^ Morganteen, Jeff (December 2, 2009). "Stamford fire service consolidation part of Malloy's legacy". Stamfordadvocate.com. Retrieved August 29, 2011. ^ O'Connor, Kara (May 16, 2012). "Charter Revision Commission recommends single fire chief". Thehour.com. Retrieved May 17, 2012. ^ Analyst, Veronica Rose, Chief. "CONNECTICUT POLICE DEPARTMENT STATISTICS". Cga.ct.gov. ^ "Pavia names Fontneau as police chief". Greenwichtime.com. ^ Dunlap, David W. (January 5, 1997). "Stamford Reinvents Its Downtown Once Again". The New York Times. Retrieved May 24, 2010. ^ "UConn-Stamford opens first dormitory". StamfordAdvocate. Retrieved December 19, 2017. ^ "Trailblazers Academy - Charter Schools of Stamford Connecticut". Trailblazersacademy.org. ^ "Welcome to Stamford Academy". Stamfordacademy.org. ^ "Domus". Domuskids.org. Retrieved January 21, 2019. ^ Scavuzzo, Diane (April 8, 2014). "Soccer News: New England Force Joins American Soccer League for Inaugural Season". soccernation.com. Retrieved July 11, 2014. ^ "Stamford Historical Society, The Stamford Historical Society: Photo Selection of the Month, July 2004, Shippan Point". Stamfordhistory.org. ^ "Stamford Youth Hockey Association". Syha.org. ^ Porstner, Donna (June 28, 2006). "Sterling Farms golfers fight to keep money". Stamford Advocate. ^ "E. Gaynor Brennan Golf Course - Stamford, CT". Brennangolf.com. ^ "Italian Center of Stamford, CT ::: Outdoor Pools, Indoor Pool, Tennis, Fitness Center, Nursery School, Camps, Banquet Hall". Italiancenter.org. ^ "Stamford Family YMCA". Stamford YMCA. ^ "Guest Welcome - Stamford Yacht Club". Stamfordyc.com. ^ "'Trisha Goddard' Talk Show Begins Production in Stamford". Stamford, CT Patch. July 30, 2012. Retrieved December 19, 2017. ^ Kahn, Eve M. (July 7, 2011). "Stamford, Conn., Antiques Centers Around Canal Street". The New York Times. ISSN 0362-4331. Retrieved March 19, 2019. ^ Just, Olivia (July 22, 2014). "New owner says Design Within Reach stays in Stamford". StamfordAdvocate. Retrieved March 19, 2019. ^ Nickerson, John (July 3, 2016). "Doug Llewelyn 'loves' filming 'People's Court' in Stamford". StamfordAdvocate. Retrieved March 19, 2019. ^ Schott, Paul (May 25, 2018). "ITV and startup announce Stamford hub, plan hundreds of jobs". StamfordAdvocate. Retrieved March 19, 2019. ^ a b Just, Olivia (July 3, 2014). "Disney moves filming of 'Millionaire' to Stamford". CT Post. Hearst Media Services Connecticut, LLC. Retrieved May 22, 2015. ^ Schott, Paul (February 20, 2017). "This Old House makes new moves with digital real estate". StamfordAdvocate. Retrieved March 19, 2019. ^ "Contact – Synapse Group Inc". Retrieved March 19, 2019. ^ "About Chief Executive Group". ChiefExecutive.net. Retrieved March 19, 2019. ^ "'30 Rock': The great state of Connecticut". EW.com. Retrieved March 19, 2019. ^ King, Kate; Writer, Staff (November 6, 2010). "New TBS sitcom filming in Stamford". StamfordAdvocate. Retrieved March 19, 2019. ^ "Jewish congregation working with sister city in Israel" (PDF). Congregationagudathsholom.org. Archived from the original (PDF) on August 13, 2011. ^ "International Trade Council... Overview". Stamfordchamber.com. Retrieved May 8, 2016. Mecca, Gregg D. (1984). "Made in Stamford: A History of Stamford as a Manufacturing Center". Stamford, CT: Stamford Historical Society. Archived from the original on October 25, 2005. Retrieved July 8, 2014. Wikimedia Commons has media related to Stamford, Connecticut. Wikivoyage has a travel guide for Stamford, Connecticut. "Stamford, Conn." . The New Student's Reference Work . 1914.